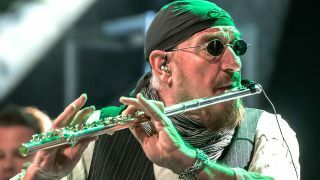 Ian Anderson has revealed he’ll celebrate Jethro Tull’s 50th anniversary next year with a UK tour. The eight dates will get under way at Manchester’s O2 Apollo on April 3, 2018, and wrap up with a set at London’s Royal Albert Hall on April 17. Anderson says: “I am not usually a birthday or anniversary kind of guy but, just for once, I won’t be a party-pooper either! “And this is a celebration of all the 33 band members who graced our ranks – musicians who brought their talents, skills and styles to bear on the performances live and in the studio. A ticket pre-sale will begin on August 30 via Gigantic.com and it’s been confirmed that there will be no support act. Jethro Tull performed their first show on February 2, 1968, at the Marquee Club in London and released their debut album This Was later that year. Find details of all eight shows below.